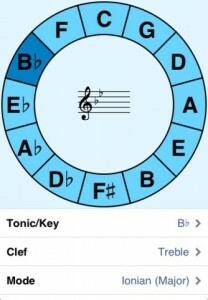 Circle Theory is a Circle Of Fifths (sometimes known as a Circle Of Fourths). The Circle Of Fifths is a tool for musicians to assist them in seeing the relationship between notes, provide key signatures for both major and minor scales, assists in transposing between keys, and it also has a helpful guide to figure out note intervals per musical mode. An iPad VGA adapter can be used to view the circle on an external screen or projector.